Award Winner of Mac Informer 5* Editor’s Pick Award. 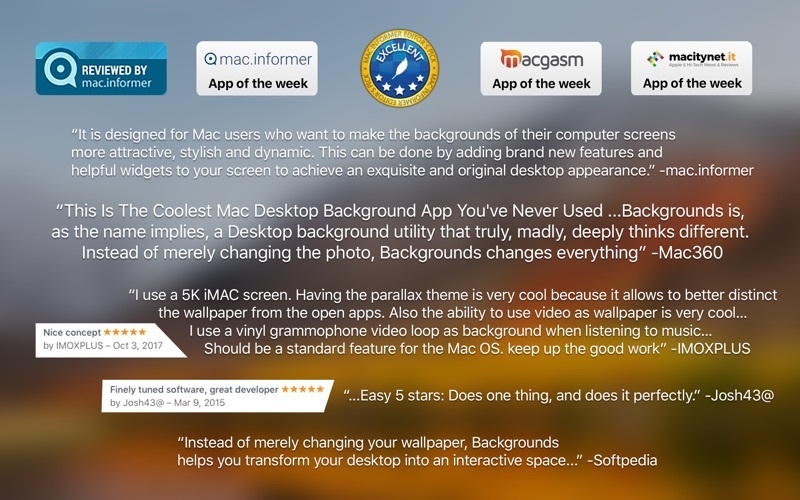 App of the Week in Mac.informer, Macitynet and Macgasm. Your desktop, like never before. 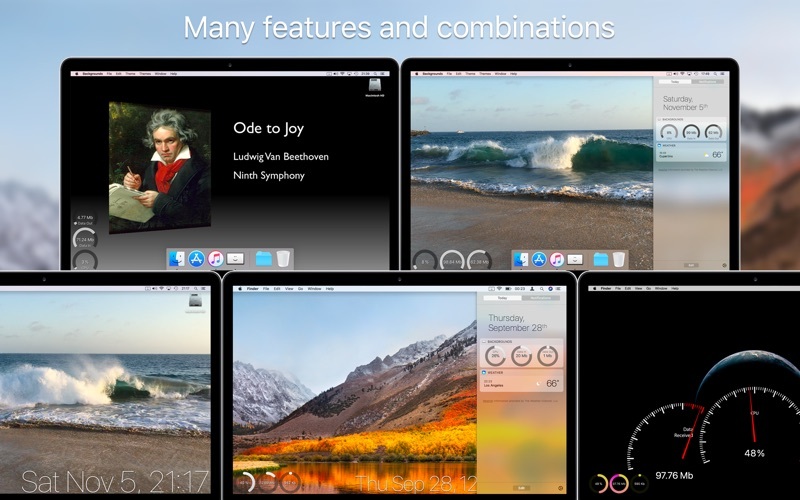 Make your wallpaper more interesting and useful with 7 themes: Music, Parallax, Video, Quartz, System, Time and Web. Includes a Notification Center Today Widget. Includes 2 Screen Savers: Glass and Quartz X. Hide your Desktop icons easily and enjoy your wallpaper. As it’s meant to be. See the artwork of the current track you are hearing as a wallpaper, or a video you have added to Backgrounds that matches the song’s title, artist, album or comments. Excellent for playing music videos. Compatible with iTunes, Spotify and Swinsian. Give depth to your desktop by moving the cursor. 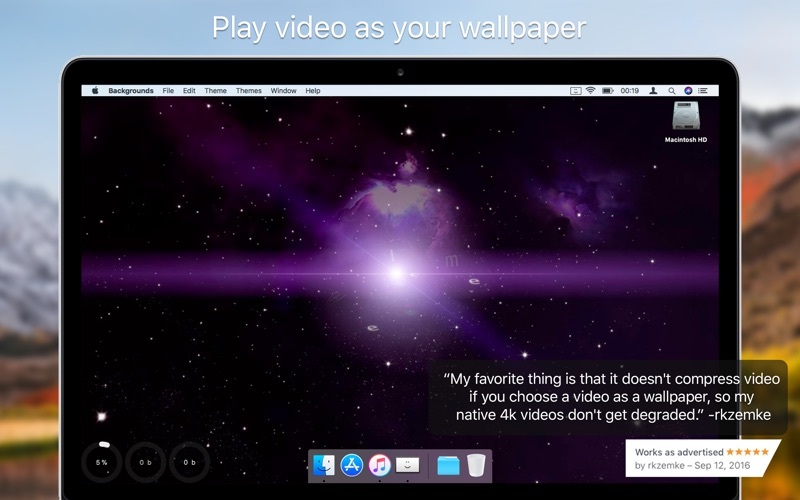 Play video as your desktop wallpaper. Express yourself with your own videos and live wallpapers. Run Quartz Compositions as a wallpaper. Make your own Quartz Compositions or download them. Access to iTunes, Spotify and Swinsian current track info. Monitor your Mac’s CPU and Network usage. Get a glance of your system’s stats from Notification Center with the today widget. Know the time or date from your Desktop. Load a webpage as your wallpaper. Create your own or use an existing one. Notification Center Today Widget: Monitor your CPU and Network usage. Check your Mac’s stats right from the Notification Center, wherever you are, without leaving your apps. 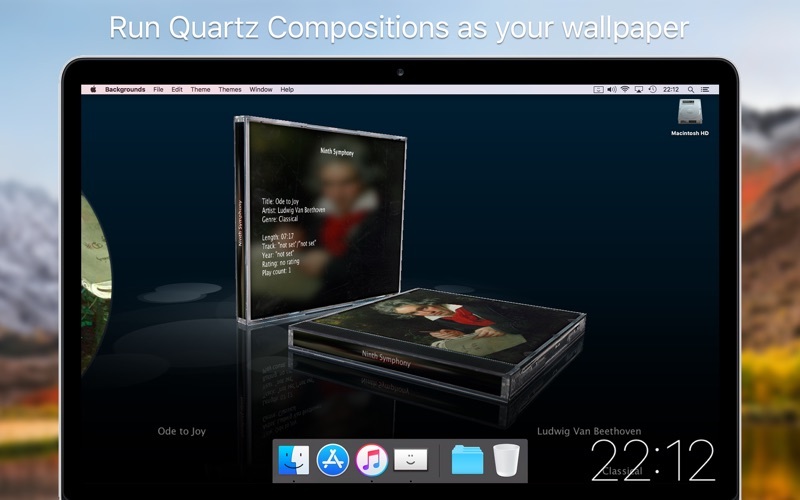 Quartz X Screen Saver: Run a Quartz Composition while you are away from your Mac. 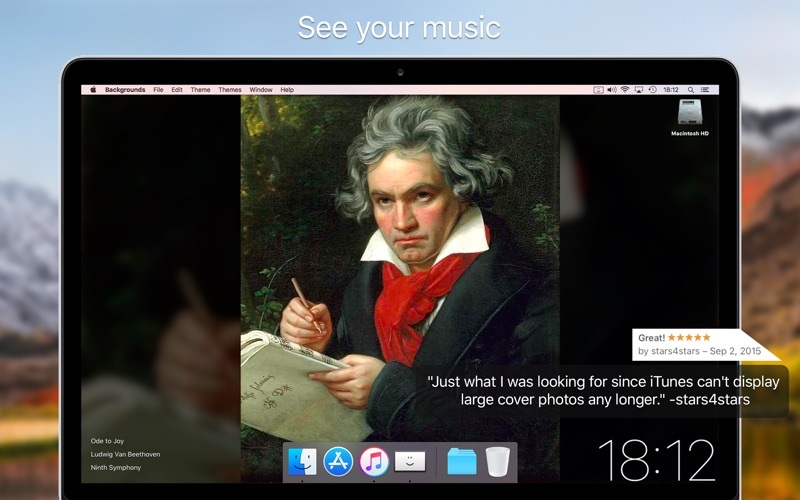 Visualize your music artwork and info when playing music with iTunes, Spotify or Swinsian. Glass, a transparent Screen Saver: Lock your Mac and see what it’s doing, from your music artwork, to a task in progress, the system status, anything. Supports Multiple Monitors with different preferences each. You can even combine them. Activate the System and Time widgets so they are always on top, even when you are using other themes. * Fixes an issue that showed a white background in System Widget and Time Widget. * Now uses the album’s artwork if the song’s artwork is empty. * Configure the side of the info labels. 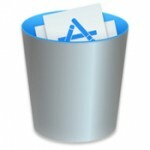 * New options for changing and removing a folder. * Run a composition at 60 FPS for smoother movement. * New dynamic colors algorithm. * Improves the dashboard legibility for small sizes. * Automatically pause a video or a quartz composition when it’s not visible. * New idle theme option to activate a theme when the system is idle. * New option to show or hide the app’s icon in the menu bar. * Show Current Item takes you to the file that’s being used or the current music player. * Updates the Quartz X screen saver. * Improves Parallax reliability for an issue that may cause Parallax to stop updating after waking from sleep. * Fixes an issue that caused a theme to disappear when exiting full screen. Copyright© Mac Torrent Download	, 2019	All Rights Reserved.